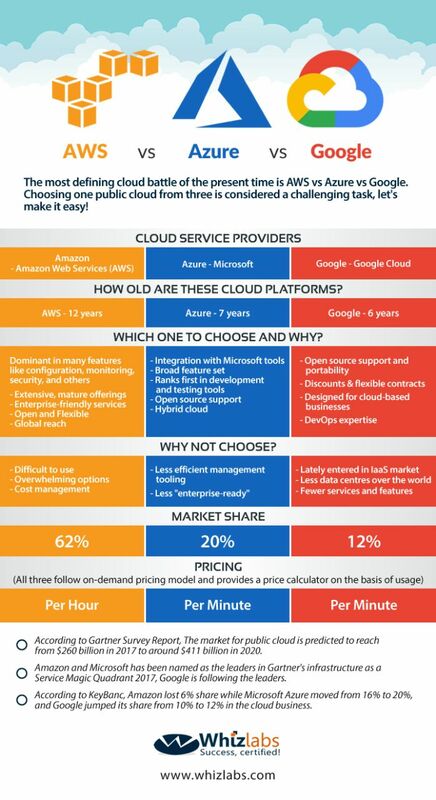 The most defining cloud battle of the present time is AWS vs Azure vs Google. Choosing one public cloud from AWS, Azure or Google is the most difficult task for the one who wants to enter and grow in the cloud world. This blog will help you make a right decision! With the growing importance of Cloud Computing, public cloud service is nowadays in huge demand. This increasing demand for public cloud is thus opening the doors of more growth and opportunities for cloud service providers. In order to grow in the cloud market, cloud companies are focused to increase their services while reducing prices to lead in the market of the public cloud. According to Gartner Survey Report, The market for public cloud is predicted to reach from $260 billion in 2017 to around $411 billion in 2020. 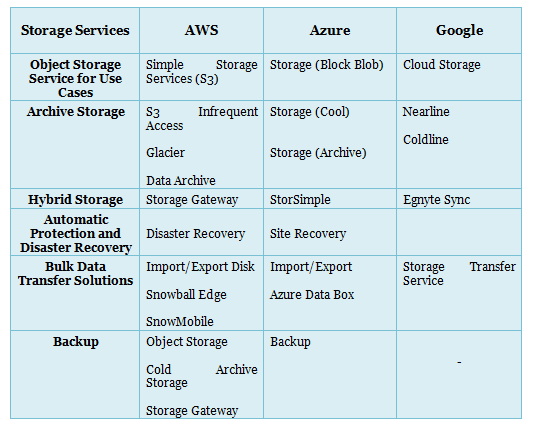 AWS, Google, and Azure are the multi-indweller cloud services that are based on their cloud computing model where the cloud service provider supply resources like database, applications, and storage over the internet. Out of these three cloud services, IaaS is well known and demanded service in the cloud market which is assumed to cross $45 billion with the passage of the year 2018. Become a certified cloud professional! Start your preparation with Whizlabs online training and practice material Now! The Public Cloud market is governed by top three public clouds – AWS, Google, and Azure. There is a strong competition between these three that can’t be recouped by any additional public cloud provider in nearest future. Amazon Web Services is dominating public cloud over MS Azure and Google since 2006 when it started offering services. Microsoft Azure and Google are far from the race but growing continuously to be at the top. 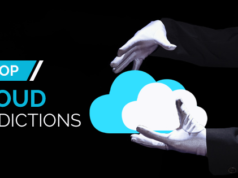 Cloud Service Providers (CSPs) offer high-quality services with multiple capabilities, excellent availability, good performance, high security, and customer support. The cloud market is governed by top three cloud services providers – Amazon Web Services (AWS), Microsoft Azure, and Google Cloud platform. Let’s dive deep into Cloud Computing by understanding the basic terms and concepts of Cloud Computing! Let’s study the AWS Vs Azure Vs Google cloud services comparison on the basis of the services offered. Compute is a computer’s fundamental role. It contains services related to compute workloads. 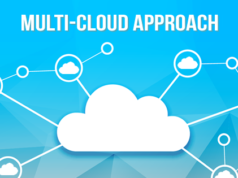 An effective cloud provider has the ability to scale thousands of nodes in just a few minutes. 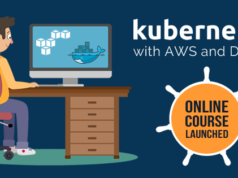 Amazon EC2 provides core computing services to configure VM (Virtual Machines) with the use of custom or pre-configured AMIs while Azure provides a VHD (Virtual Hard Disk), which is similar to Amazon’s AMI to configure VM. Google provides Google Compute Engine to introduce cloud computing services. 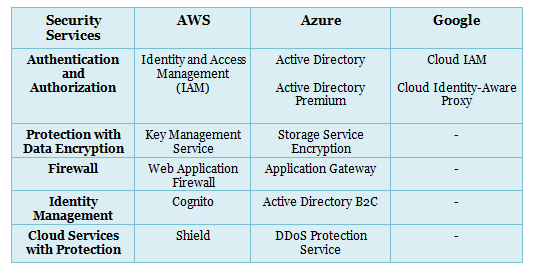 On the basis of services provided by the compute domain, the difference between the top three public clouds is given by the following table. Both the Amazon and Microsoft has been named as the leaders in Gartner’s infrastructure as a Service Magic Quadrant 2017, Google and IBM are among those following the leaders. A database provides services related to database workloads. It is worth note here that Azure supports big data and both the NoSQL and relational databases. 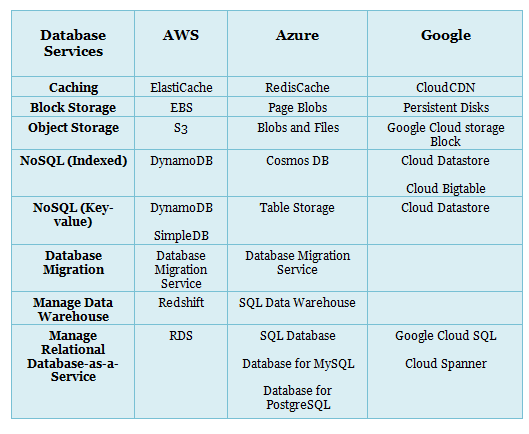 On the basis of services provided by database domain, the difference between the top three public clouds is given by the following table. Each cloud service provider offers different networks. Amazon’s network is the Virtual Private Cloud, Azure’s network is the Virtual Network, and Google’s network is the Subnet. On the basis of services provided by networking & content delivery domain, the difference between the top three public clouds is given by the table below. Each of the top three public cloud providers provides a range of monitoring and management services. These services support performance, infrastructure, workloads, visibility into health, and utilization of the applications. 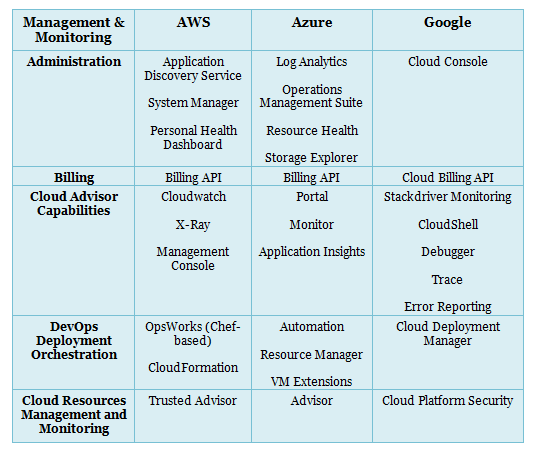 On the basis of services provided by management & monitoring domain, the difference between the top three public clouds is given by the following table. Confused about which AWS certification is right for you? Let’s clear out the confusion which AWS Certification you should choose! Development tools are used to build, diagnose, debug, deploy and, manage multiplatform scalable applications and services. On the basis of services provided by development tools domain, the difference between the top three public clouds can be given as given in the following table. Amazon provides top-rated cloud security services. Fortinet in Amazon Web Services (AWS) provides security features to Amazon Virtual Private Cloud (VPC) in many availability zones on-demand. While in Microsoft Azure, Fortinet supplies optimized security for data and applications and remove extra security expenditures during migration. 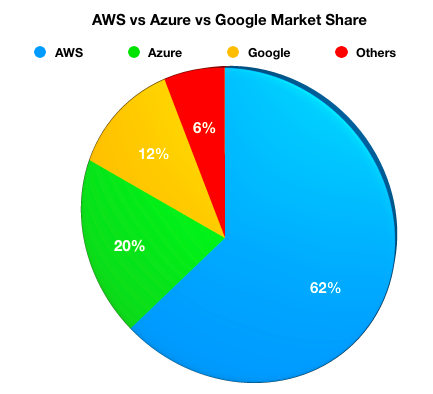 What is AWS Vs Azure Vs Google Market Share? In revenue terms, Amazon Web Services (AWS) outshines the Cloud Market with 62 % market share which is more than three times from the market share of Azure and five times from the Google Cloud Platform. While Microsoft Azure and Google Cloud Platform have only 20% and 12% market shares. The revenue and thus, the market share of Azure and Google is showing a considerable growth with the time. It is making Google and Microsoft Azure the other two giants of cloud market after AWS. These two have got all the technology, power, wealth, and marketing in order to attract enterprises and individual customers to their services. According to KeyBanc, Amazon lost 6% share while Microsoft Azure moved from 16% to 20%, and Google jumped its share from 10% to 12% in the cloud business. 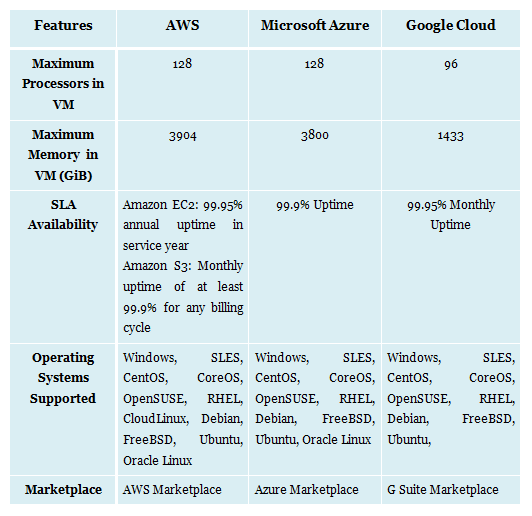 What is AWS Vs Azure Vs Google Pricing Structure? Whether the customer is an individual or an enterprise, all of these cloud services make cloud offerings with a pricing model. This is the best characteristic of these cloud service providers as you don’t need to buy a cloud solution. The pricing model these clouds follow is to pay as you go; it means you need to pay on the basis of usage. Considering AWS Vs Azure Vs Google, Amazon charges on an hourly basis while Azure and Google charge on the minute basis. One can choose to make advanced payments i.e. prepaid or monthly payments i.e. postpaid. So, in this blog, we had a Cloud Services comparison for AWS vs Amazon vs Google 2018. We have described comparison in terms of different services offered by these public clouds, market share, and pricing. But the actual research while choosing the best cloud service provider depends on what you need and what the provider offers. So, a good analysis is required while making the selection for the best cloud service provider. Want to become a Certified Cloud Professional? Check out this list of Top 5 Cloud Certifications in 2018. This battle cloud between AWS, Google, and Azure makes us conclude that whatever cloud service you will opt, you will be happy. Due to the competition, all the cloud service providers are trying to attract customers with the extended services at reduced prices. So, if you are an enterprise or an individual looking for a cloud service provider, take the advantage of this moment. And if you are the one looking to make a career in cloud computing, you can get a certification offered by these cloud service providers. Whizlabs is providing Online Courses and Exam Simulators for Cloud Computing certifications. Whether you are preparing for the AWS certifications, Azure certifications or Google Cloud Certifications, Whizlabs online training and practice material will help you. So, start your preparation now and become a certified cloud professional! Have any query or suggestion? Feel free to write here or just leave a comment below, we will be happy to respond! I loved the article, well explanied, straight to the point and with a lot of visual aid to fully understand the comparison. Im looking for a AWS Certified Solutions Architect to help me implement a project. Do you know anyone with this certification? Thanks Neeru for such ii normative article. Thank you for sharing information about the AWS, will you please elaborate about the cloud services? All cloud engineers/arch needs someday to get this comparison. and you did the job for a lot of us. Thanks for the good words, Alpha! 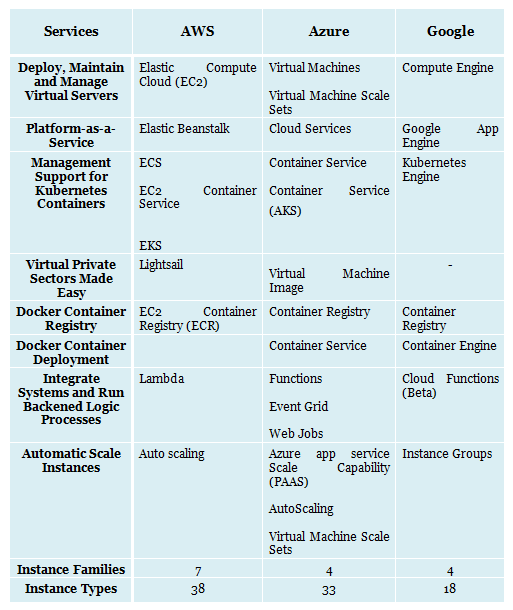 Very amazing explanation about these 3 major cloud platforms. I am looking AWS Certification and Please suggest me to get which certificate is better compared to others. Associate Level Certifications: There are three associate-level certifications offered by Amazon. Professional Level Certifications: There are two professional level certifications offered by Amazon. Specialty Certifications: There are three specialty certifications offered by Amazon. So helpful, thanks for your contribution. I recently left Education and just began a career as a Technical Implementation Analyst. My new company specializes in Managed and Professional Services, so I am stepping into a brand new world. I have to say that this article did a great job of explaining cloud services to me. I was a nit confused about the differences between the 3, but this article clarified a lot of my questions. Great job. Sure Venkat. Will cover a separate article on AWS vs Azure vs GCP Vs IBM Cloud Soon. You have written an awesome article. I can only imagine that how deep you have dig in to get to the this sort of unbiased comparison. However, I think you should have written something on the managed Amazon Cloud hosting, or google cloud managed hosting or which hosting is providing the best managed hosting or something like that. I am not sure if the companies like Cloudways, or Flywheels are doing the job right. Actually, we’re planning to cover a separate article on the cloud hosting services but sure I’ll something here too. Yes, Cloudways is providing AWS Cloud hosting while Flywheels’ hosting infrastructure is powered by Google Cloud.